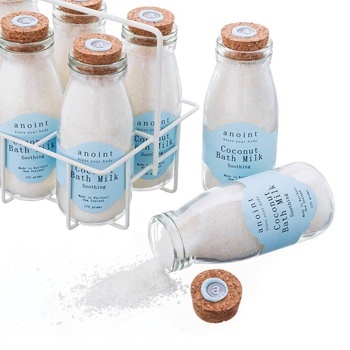 Anoint Coconut Bath Milk presented in a mini milk bottle with a cork lid & finished with Anoint's signature wax seal. A soothing & nourishing combination of natural ingredients - bless your body! Ingredients: Powdered Coconut Milk, Epsom Salts, Essential Oils of Lemongrass. Enjoy a therapeutic experience. Add to a warm bath or foot spa. Check out our other products in the Anoint range.